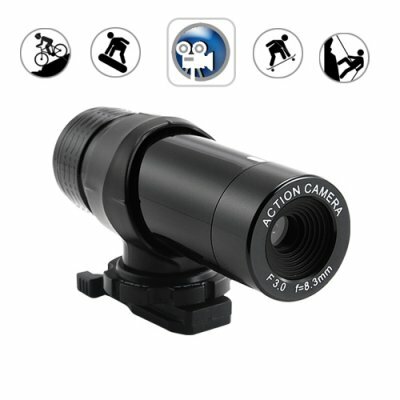 Successfully Added Cyclops - Extreme Sports Action Video Camera to your Shopping Cart. Our finest sports action camcorder with attitude - The Cyclops Sports Action Camera. When only the very best will do, the best rely on The Cyclops! Virtually Indestructible - Ruggedly constructed from a Kevlar-like polymer which is five times stronger than steel on an equal weight basis. Mounts On Anything - Includes every attachment you will need to mount and stabilize this sports action camera on: Anything. Anywhere. Anytime. High Quality Videos - Capture your sickest moves and most radical sequences in 30 fps AVI format motion picture! Whether you're trying to stick that True Spin Mistrial or body articulate a Switch Hard Flip, this is the camera for you! Whether your passion is: base jumping, high wire, sky surfing, aggressive inline skating, extreme motocross, ice yachting, or street luge - The Cyclops is your one way ticket to becoming a Youtube oh-my-GOD! If you take it to the limit every time, every day, you owe to yourself to document your awesomeness with this IMAX-inspired sports video camcorder! Buy one for yourself and buy eleven more for your online store - brought to you by the online sports action camera experts - Chinavasion. Securely and easily attaches to practically any surface including sports helmets and mountain bike handle bars with its versatile array of mounting attachments. Does The Cyclops record noise? Yes. Videos do include audio tracks. How easy is it to use to this camera? Press and hold the one and only button on the unit for two seconds. A solid green light appears. It's now ON. Press the button again briefly. The green light starts blinking. It's now recording. Press the button again briefly. It has now stopped recording. Start and stop recording? Press the button. To power the unit ON and OFF? Press and hold the button. Yes, it's that easy. Basically you would probably be better with the $40 real action camera on chinavasion. I bought this one thinking the more expensive one would be the better option. I was wrong. there is nothing terribly wrong with the actual video. In fact its great for such a small device. but where the product fails is the audio, the audio is crackly and hissy. Not good when you want to use it as a security device and listen to conversations. Otherwise try one and see if you like. Good quality of video and price. Fast delivery, perfect condition, very good action camera, best price! I'm planning to use it in little housing for diving activities..